My new friend Becky told me about her new way of eating and how she basically eliminated sodium from her diet and, without trying, dropped a lot of weight. I was so fascinated by her new "lifestyle", and i asked her for some of her pointers and tips. Meantime, that evening we were at Beth's, and Beth told me to try this delicious granola that Becky makes. I've always liked granola, but never thought about making it. In fact, i rarely buy it because i find it's usually very high in calories. Let me tell you, Becky's granola is delicious! Not too sweet and contains no salt, so how bad could it be for you? I'm now addicted to it and I've been eating it in my yogurt or cottage cheese and fruit mixture just about every morning. I LOVE IT!!! 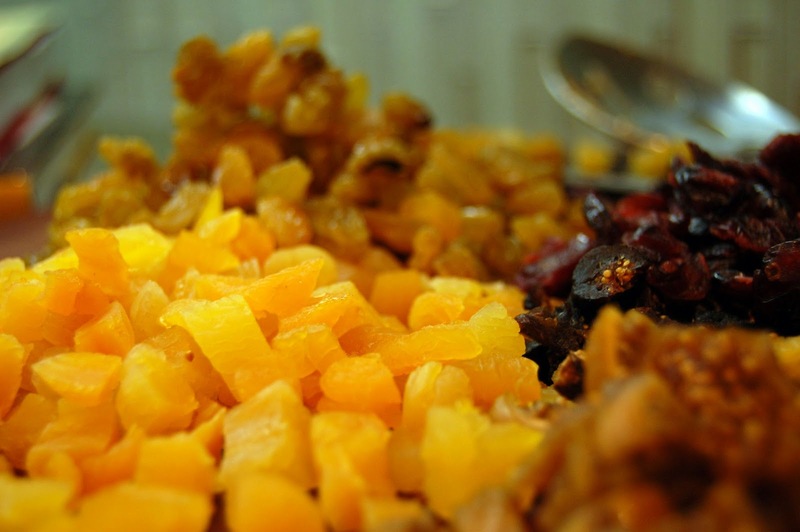 And each time i've made it i do a little something different - whether it's the variety of dried fruit, or adding some extra grain. The last batch i added flax seed, which added a nice dimension. Anyway, you can't go wrong with this. Oh... my friend Kevin tried it and thought it was delicious, so the next time i made it i doubled the batch and brought some in for just about everyone. It's been a hit! In a large bowl, mix all dry ingredients except raw sugar (first 5), together in a large bowl and put aside. 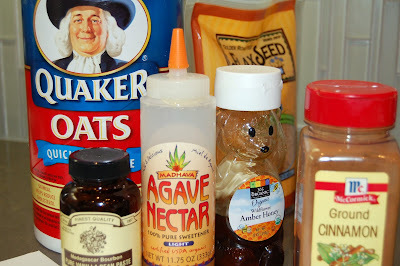 Combine wet ingredients and raw sugar in a small bowl then combine dry and wet ingredients. Spread on a cookie sheet sprayed with cooking spray. Cook at 300 degrees for about 40 min. turning every ten minutes or so until medium brown. 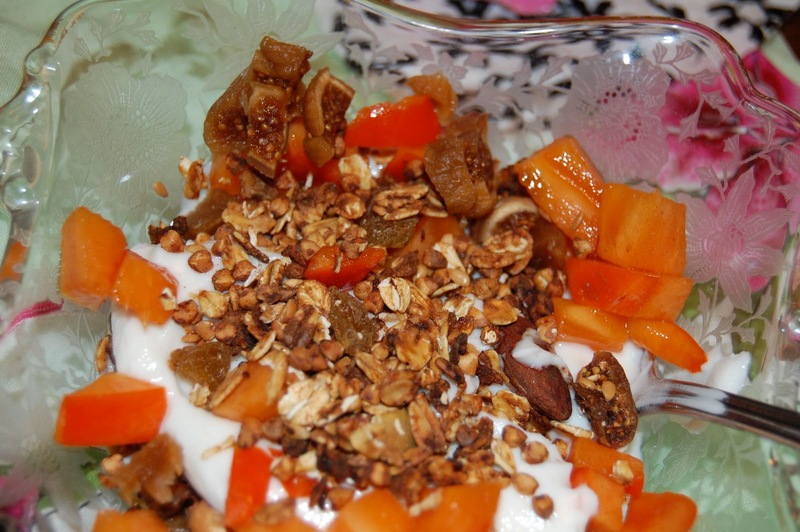 Taste granola, if it isn't sweet enough drizzle some honey over hot granola. Let cool. 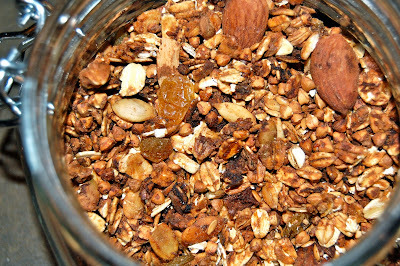 Note- finished granola will be slightly sweeter with the dried fruit. Usually, it is sweet enough. 1/2 C of any other dried fruit you would like- I used cherries, cranberries and blueberries but apples would be good and if you can find dried sweet pumpkin that would be good, too. I love mine in the morning with yogurt and chopped fruit. Here i've used chopped persimmon and dried figs. Yummy in the tummy!